Inspired. That’s how I feel at this very moment. Why? Because I have just spent the last seven days on a ship, floating around the Caribbean with an amazing group of women. We were together a part of blogger retreat called Click Retreat, where we focused on improving our photography. Initially, I went for two things: to lay in the sunshine and improve my food photography, but I came away with so much more. Not only was I able to meet some of the bloggers that I have admired forever, but I also came away with new friendships. My roommate for example, Hayley from The Domestic Rebel, is so awesome and I know that we are now going to be life long friends! I’ve never been on a retreat before, let alone one designed for bloggers, but the experience was so much more than I ever could have hoped for. I learned so much, not just how to improve my photography, but also about myself and about becoming a successful business owner. I’m so excited to share more about the experience with you – including the food and what it was like to travel on a cruise with food allergies – but also all the things that I have planned just for you. So many things are on the horizon for us, it’s hard to contain my excitement! But as fabulous as my time with my Click Retreat ladies was, I have to say it is nice to be home. I missed Matt and Trevi (of course), but I also missed my bed, my kitchen, my shower, and even my desk. And I missed my own food. Honestly, that’s one of the hardest things about traveling for me. While I’m able to enjoy new types of cuisines, I truly miss the lifestyle I have created for myself at home. My daily green juices and smoothies. My hot quinoa breakfast cereals. My Sunday morning banana pancakes. My gigantic kale salads. My quinoa soups. And my quinoa mac and cheese. 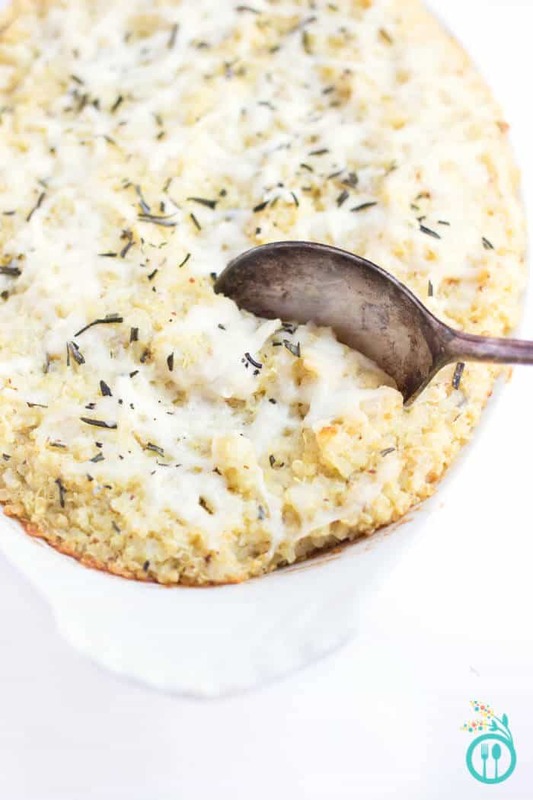 Oh my quinoa mac and cheese! 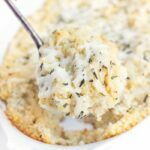 It’s been a staple in our house for almost a year now and is a recipe that we make whenever we are craving something super comforting and familiar. Each bowl is like a big healthy food hug. As I’m sure you know, the base of that recipe is squash. We’ve removed all the cream and heavy dairy, and replaced it with a healthy, vegetable based sauce. Not only are we able to lighten up the whole dish, but we’re also able to pack in some good-for-you nutrients with it. It’s like indulging in a childhood favorite, without the actual indulgence! With a new variation in the works, I knew I wanted to stick with the veggie theme. In the past, I’ve thought about carrot, contemplated spinach or some other green, but I just couldn’t seem find the right flavor combo. I’ve made my creamy vegan alfredo sauce countless times, so it kind of boggles my mind that it didn’t come to me before now, but I knew instantly that it was the variation I had to make for you next. 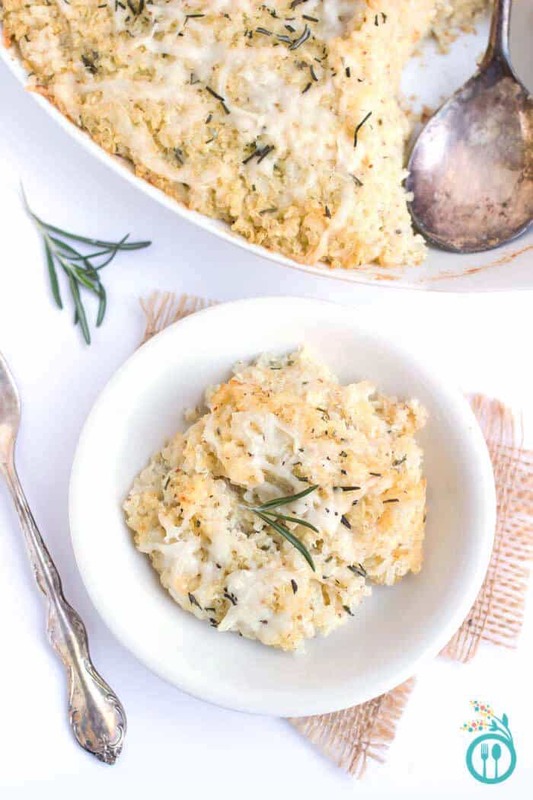 Plus, it would be a fun, white version of our quinoa mac and cheese – perhaps a tad more elegant and dinner party worthy, and still just as tasty. The recipe came out just as I had hoped that it would. It’s rich and creamy, but not in the gross, roll-me-out-of-here type of way. 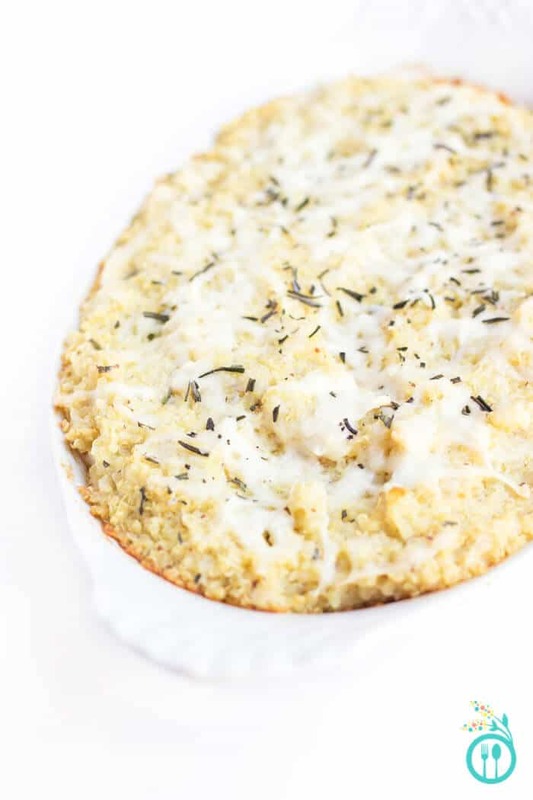 It still tastes surprisingly light and won’t leave you overly stuffed or engorged like a big old bowl of the traditional gluten and dairy stuff would. You’ll love how healthy and guilt-free this recipe is. The base is just cooked quinoa, steamed cauliflower, some raw cashews, a bit of shredded cheese (either goat or a vegan variety), and spices. The sauce is made in your blender, then you just mix it all together and bake it up until it’s bubbly. It’s makes a perfect weeknight meal, works well as a freezer meal, AND is totally snazzy enough to serve at your next dinner party. Can’t wait to hear what you think! And if you have more mac and cheese flavor combos you’d like to see, make sure to leave me a comment below! If you've made a Simply Quinoa recipe, please share it with me! Just use the hashtag #simplyquinoa when sharing your photo – I adore seeing all of your creations! 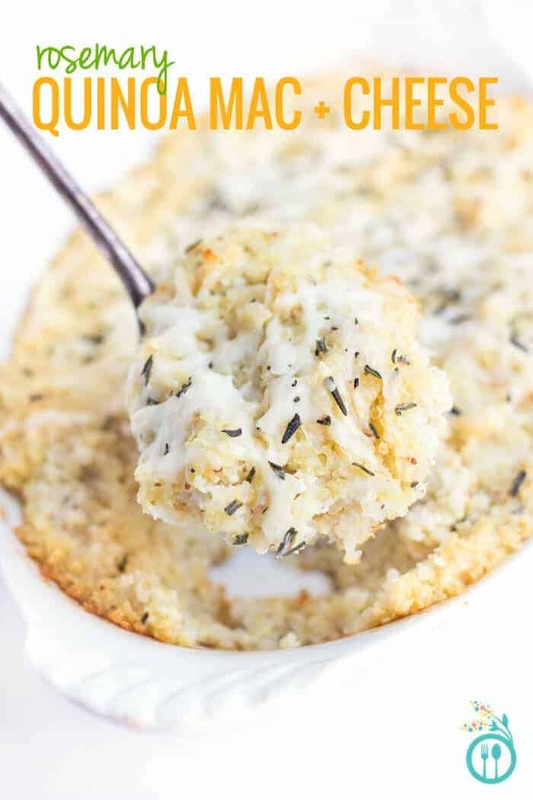 It’s been a staple in our house for almost a year now and is a recipe that we make whenever we are craving something super comforting and familiar. Each bowl is like a big healthy food hug. Preheat the oven to 375 degrees F. Grease a baking dish with cooking spray and set aside. Steam the cauliflower florets until tender, about 10 - 15 minutes. When done, remove from pot, transfer to a blender and add the cashews, 1/4 cup of almond milk, mustard and spices. Blend until smooth, adding more almond milk 1 tablespoon at a time until the texture resembles a very thick soup. Set aside. Place quinoa in a large mixing bowl. Pour sauce over quinoa, add 1 cup of cheese stir to combine. Fold in rosemary, reserving a tablespoon for sprinkling on top. Transfer mixture to prepared baking dish. 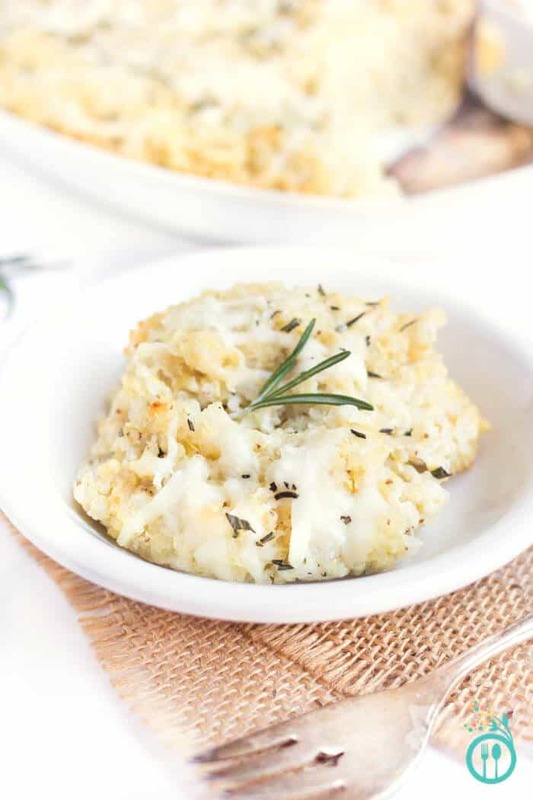 Sprinkle with remaining cheese and rosemary, and bake for 20 - 30 minutes until cheese has started to brown and the filling is bubbly. If you're freezing, you can either freeze before baking (just let defrost night prior and increase baking time slightly) or freezing after baking and just reheating when ready to eat. This was an amazing dish for a cold February night! Really lovely, good stir in nutritional yeast (no, not yeast) very savoury and cheesy for me, cheese for him. Everybody happy. Funny really, I just got two packets macaroni gf sales drive and before floods. Good timing eh, so Hogmanay on way, shortbread ready and vegan haggis recipe found at last, burn’s night and happy new year to all. Thanks ally’s don, came up trumps again then. Oh, and more photos of georgeous dog please! Oh, geez… and I thought the Quinoa Pizza Crust would never be topped… haven’t made this yet, but I think we have a “Ding, ding, ding” here!!! Me too hapster, getting lucky here then!